Taiwanese designers, Yu-Ting Cheng, Yu-Hsun Chung and Shaw-Chen Chen, have created a fun and functional product in their Wheel and Seal umbrellas. Designed for kids who love splishing and sploshing in the rain, the umbrellas feature a pair of spongy wheels (or an absorbent seal) at the tip of the cane that absorb water from the inevitable puddles they pass through and leave a trail of smiley faces… Not only does this encourage urban kids to get out and enjoy nature at its best, it also spreads whimsical joy to passersby. 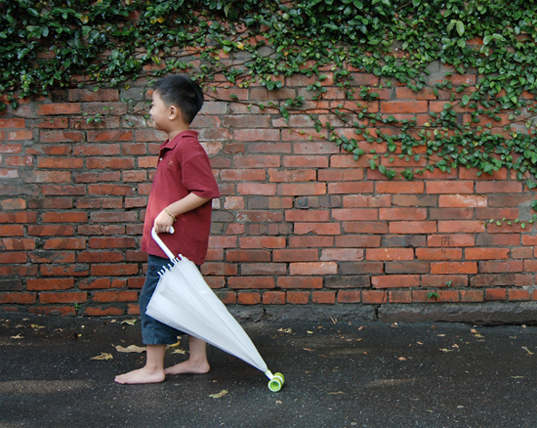 For those who live where it rains in the summer, it might be cool to get the kids this umbrella, dress them up in colorful rain gear and shoot some photos/videos of the kids playing in the rain. Getting a close up of the trail of smiley faces w/the kids in the background would make for a great memory. Taiwanese designers, Yu-Ting Cheng, Yu-Hsun Chung and Shaw-Chen Chen, have created a fun and functional product in their Wheel and Seal umbrellas. Designed for kids who love splishing and sploshing in the rain, the umbrellas feature a pair of spongy wheels (or an absorbent seal) at the tip of the cane that absorb water from the inevitable puddles they pass through and leave a trail of smiley faces... Not only does this encourage urban kids to get out and enjoy nature at its best, it also spreads whimsical joy to passersby.